A new restaurant is to open in Hull’s Fruit Market waterfront quarter offering a deliciously authentic taste of Italy with some of the city’s best views. Bert’s Pizza and Gelato is the second Italian restaurant to be opened by the family owners of successful East Yorkshire venue, Bert’s Pizzeria. The owners have chosen a prime riverside spot for Bert’s Pizza and Gelato, meaning diners will enjoy stunning views overlooking the Stage @TheDock amphitheatre and Hull’s iconic aquarium, The Deep. 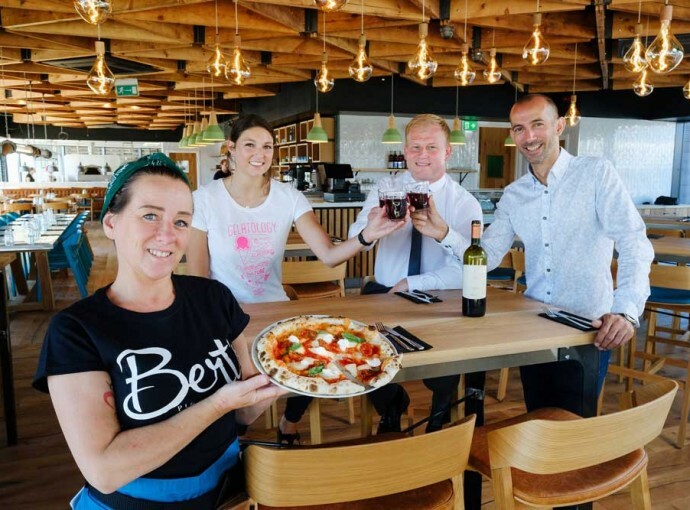 Bert’s Pizza and Gelato is the latest business to open at the flagship @TheDock site developed and owned by regeneration company Wykeland Group, which features the Centre for Digital Innovation (C4DI) tech hub. The Bert’s team knew the location on Hull’s own “riviera” was perfect as soon as they set foot inside No. 1 @TheDock. Ellie Mewburn, owner of the new Bert’s Pizza and Gelato and Bert’s Pizzeria in Brandesburton, said: “As soon as we walked in, we said ‘this is Bert’s’. The floor-to-ceiling windows are very similar to those at our Brandesburton restaurant, which also has a view over an expanse of water. It’s us. “The Fruit Market feels like the up-and-coming area in Hull right now. It’s the place to go for a dining experience and a great night out, and it’s where we and our staff like to have nights out when we’re in Hull. In keeping with the family feel, both Bert’s restaurants are named after Ellie’s grandfather, Bert Mewburn, and the opening of the 3,100 sq ft Fruit Market venue has created 24 new full and part-time jobs. The restaurant has 80 covers inside with tables seating a further 32 customers outside for al fresco dining looking on to Stage @TheDock and the waterfront. John Gouldthorp, Asset Manager for Wykeland Group, said: “We’re very excited about the opening of Bert’s Pizza and Gelato and we’re sure it will be a great success. “The location on the ground floor of No. 1 @TheDock gives Bert’s one of the best views of any restaurant in the region, overlooking the Stage @TheDock amphitheatre, the Humber, River Hull and The Deep. “We’re really impressed with the fit-out and we’re sure Bert’s will be hugely popular, both with workers in and around @TheDock and the ever-increasing numbers of visitors to the Fruit Market. 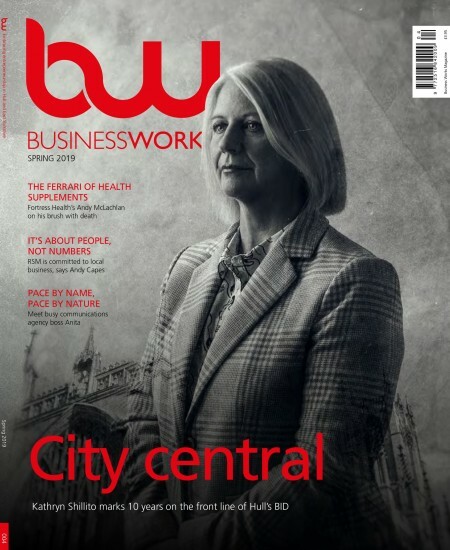 In addition to hundreds of workers based at C4DI, @TheDock also hosts the digital team of Arco, the UK’s leading safety company; the UK public safety team for global defence and security company Saab; and the headquarters of medical negligence and personal injury law firm Hudgells. In total @TheDock currently offers 45,000 sq ft of office space, with a further 35,000 sq ft having planning consent. The development includes Stage @TheDock, created by Wykeland within the historic former Central Dry Dock, and Nibble, a high-quality breakfast, brunch and lunch restaurant which is undergoing expansion to meet demand. With @TheDock now fully occupied, plans for further office space on the site are being worked up. Bert’s Pizza and Gelato will will be open seven days a week from 10am until late, from Wednesday, July 4. Coffee, gelato and cake will be served from 10am, and the full menu from noon. Customers can expect top-quality ingredients, a simple menu and great value for money. Prices for a 10in rustic artisan pizza range from just £5.95 to £8.95 and prices for handmade gelato start at £2.10. For more information about Bert’s Pizza and Gelato in Hull and Bert’s Pizzeria in Brandesburton, visit www.bertspizzeria.co.uk or follow @bertspizzeria on Facebook and Instagram.